I’ve had little time to keep up with my blogging, but at least I have finally been able to begin posting my lovely little collection of haori jackets for sale in my kimono shop. The first five were just listed, so do click the “Buy Vintage Kimono” on the menu above to drop by to take a look. They would make wonderful holiday gifts for yourself or anyone else. I’ll try to add a few more every couple of days until I’ve gotten my entire stock listed. This entry was posted in kimono on October 31, 2008 by admin. Under the gorgeous full moon a few nights ago, my friend Judith Clancy and I attended a gagaku concert in the garden surrounding Shimogamo shrine. Areas of the garden were lit with flood-lamps, which guided our way as we walked through the large gardens toward the stage outside one of the main buildings of the shrine. Though the autumn nights are definitely getting cooler, it was still lovely to join the audience clustered before the open air stage. 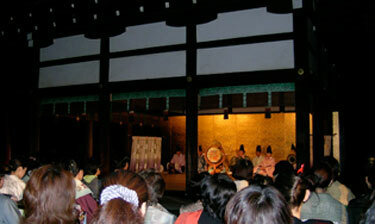 Many in the audience had also attended Tea Ceremony before the concert and were still dressed in kimono. Gagaku is the oldest form of classical music in Japan, having been brought to Japan from China in the 7th century A.D., a time when Japan was busily assimilating extensive amounts of Chinese cultural and political practices. The word gagaku translates as “elegant music” and is played by an ensemble of 3 percussion instruments and 3 wind instruments. As the tradition developed in Japan, gagaku was performed by hereditary guilds of musicians and even today many members of the Imperial Palace Music Department are descendants of the old guilds. Gagaku is often accompanied by a classical dance called bugaku. And of course, the spectacular costumes worn by both the muscians and dancers, as well as the draperies gracing the stage, added a visual treat to the evening’s entertainment. This entry was posted in Kyoto living on October 16, 2008 by admin.